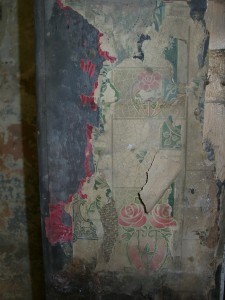 Home / archaeology / Elizabeth reunited with historic Wallpaper at the Birmingham Back to Backs! Elizabeth Perkins, the Director here at the Conservation Trust, has finally been reunited with the wallpaper that she stripped of the walls of the Back-to-Back houses in Birmingham 8 years ago! The back to backs are run by the National trust, but the rescue and restoration of the properties was carried out by the Birmingham conservation trust – with Elizabeth driving through much of the project. As a volunteer for the Birmingham Conservation Trust and the Back-to-backs I was very excited to see Elizabeth come back to the houses and see the wallpaper that she saved all those years ago! A decade ago the buildings looked very different to what they do now and were in a very fragile state. The houses hadn’t been lived in since 1966 but the walls were hung with layers and layers of wallpaper in all sorts of colours and patterns that former residents had decorated and brightened up their small dark houses with. Before the builders came in to restore the houses Elizabeth literally stripped the layers of wallpaper off so they could be saved for the future. So finally after 8 years the Wallpaper Project at the Back-to-backs, funded by the Heritage Lottery Fund, has meant that the layers of wallpaper that furnished the houses can be conserved, researched and ultimately displayed for all to admire (see details below). My father was a painter and decorator and so always had large catalogues of wallpaper samples which he took round his customers. As these got renewed and updated I was allowed to have the old catalogues and used the paper to cover all my exercise and text books for school. I had the most colourful and elaborately covered books in the whole school as I used many of the embossed and flock papers. My artwork folder was like a patchwork quilt with many different squares to cover the whole folder. Another memory is when I was told I could have my own bedroom and stop sharing with my sister. I was allowed to choose all the decoration and remember picking for the walls a white wallpaper with little lilac roses all over it. The wallpaper used by the working class in their homes is actually extremely rare, which is what makes the exhibition so unique! The wallpaper spans over a century dating from the 1840’s to the 1960’s giving an insight into how ordinary people decorated their homes, and also the changes in taste and manufacture of wallpapers over the years. Husnara Bibi, the Skills for the Future trainee has had the mammoth task of embarking on this project with the help a group of volunteers like myself cataloguing, conserving, researching and preparing the wallpaper for the exhibition that will launch on the 12th June at the Back-to-backs . 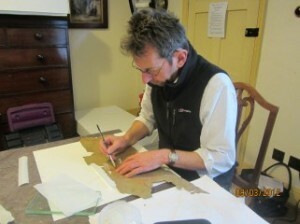 The process of conserving the wallpaper involves cleaning of the dirt, separating the layers and then carrying out tear repairs. This has all been done in the studio which is actually No 50 which is one of the front houses of the court where the wallpaper we are conserving once covered the walls! Elizabeth came along to the studio and had a go at repairing the tears of the wallpaper she ripped off the walls all those years ago! She also met for the first time Graeme Storey, the wallpaper conservator who advised her on the wallpaper all those years ago. Make sure you visit the Wallpaper Exhibition when it launches on June 12th!